A good Customer Relationship Management (CRM) tool will give you insights on your customers. At the bare minimum they will allow you to store your customer relationships (your leads) so you can email them at different times of their buying or selling process. 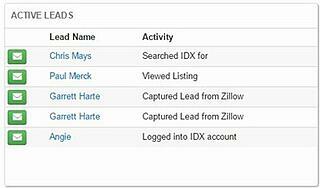 Some CRMs will be better than others when it comes to managing real estate leads. 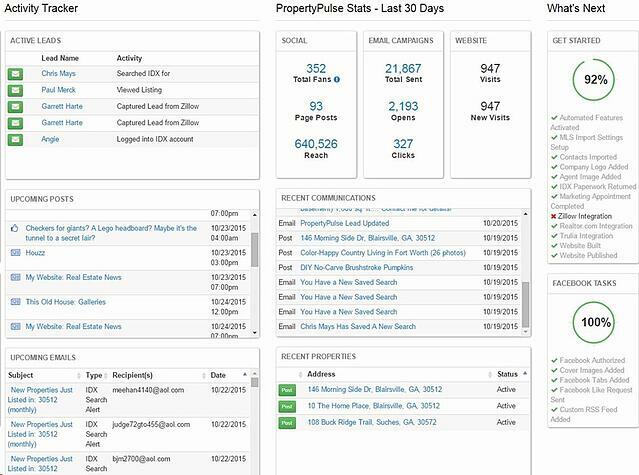 When you log into PropertyPulse the first thing you see is the Dashboard. This is your command center that will provide your most important statistics at a quick glance. The section we are focusing on today is the upper-corner box titled "Active Leads". In your active leads box, you will be present your most recently active leads. This will include your newest leads and older leads that are re-engaging with you through your real estate website and Facebook business page. This box will allow you to email them directly from the dashboard, click on their name for more information, and also tell you what activity they exhibited. For new leads, you will get an email alerting you of a new real estate lead. The notification email will give you more details such as their contact information and what property they were looking at. (If they were captured on an IDX page). The dashboard will tell you the source of that lead. Possible sources can include Zillow, Trulia, Realtor.com, add/importing leads, IDX pages, Facebook, etc. For old leads, you do not get an email notification for activity. Their activity will primarily be displayed to you in the dashboard and their individual lead pages. The active leads box is the best place to see which leads are engaged with your marketing. Examples of activity we display is reading an email, clicking on a link in an email, looking at a listing, and doing a home search. To get a return on your investment, we recommend to log in to PropertyPulse at least once a day. Automated emails are regularly being sent, so your leads' activity will be tracked and updated in the activity tracker. Use this information to guage which leads you should be following up with personally, and which leads you should let PropertyPulse continue to nurture. To learn more about what PropertyPulse can do to benefit your business, sign up for our free trial!